The 8750H runs hot in every laptop I've seen. I came from a GS65 (very thin and light), which had an MSI implemented 90c throttle. With -150mV on CPU, it barely throttled in cinebench (occasionally a tiny bit), and in games it ran around 80c. Which was fine... (Also worth noting this was single channel, and maybe bottlenecked the CPU a little) AND only ran a 1070MQ. Now, I expected the GL704 to manage thermals much better due to larger size&thickness. Asus allow the 8750H to hit 95c before throttling, and as stock it hit this without much trouble. Repaste with Kryonaut, dropped temps maybe 5c, but still have throttling issues. This CPU will only manage -70mV (luck of draw). With undervolt and repaste, I barely get any throttling, CPU pushes low 90c in Apex/BF5, and occasionally spikes to 95c with small undervolt. (This is a combined load with a 2070 non-mq GPU, which has shared heatpipes, and I am seeing higher CPU temps in game than with cinebench alone) This is with dual-channel RAM, which may push CPU a little harder, and gain a few centigrade. Interestingly though, I THINK Asus allow for a larger power draw from the CPU. In game, I regularly see 40W+ continuously, and when it does throttle cinebench scores only drop slightly. (GS65 would drop to 900, whereas GL704 never goes under 1150 or so). I think Asus push more out of the 8750H here, and is in part why the thermal performance appears worse, when actual performance is typically better. Also the shared heatpipes with 2070 pulling 115W will likely be a BIG contributor to high thermals on CPU in game. Despite not really seeing throttling in game after repaste and undervolt, I am still planning to LM the GL704 as I know this could bring -20c on CPU and GPU. Main benefit here will be fan noise reduction, along with knowing it will never thermal throttle. So my GL704GW CPU hits 99°c while playing GTA5 for no more than 15min, with trotteling to below 3GHz on all cores. Now the laptop is at warranty to repair this, because Asus said if i do repaste my self or anyone else except them, it will void the warranty. But more i look at forums, more i think that this CPU really runs hot AF! Plus on my laptop i can also uV to around -70mV, lets say more -65mV. About cinebench i got scores from 1279 (highest) and all the way down to 1170ish. No idea what to think about this, could be unoptimized software or even designing flaw...? CPU will throttle at 99c based on Intels specs. I was under the impression that Asus limit this to 95c in the GL704. Maybe you have different BIOS or version of Asus control software? I'm unfamiliar with GTAV, if it uses heavy AVX instruction sets, this could be a reason for stupid temps. Is it similar in other games? Throttling down to 3GHz with a -65mV, and hitting 99c definitely stinks of a very poor paste job to me. Honestly, I am not sure how Asus would determine you had repasted.My GL704 had no warranty stickers etc on the back panel, and the CPU cooler had a small warning sticker over one screw (which was easily reapplied after repaste). Also worth noting, Kryonaut is a very similar colour and consistency to the stock paste used by Asus, and really wouldn't be noticeable if you changed this. I'm pretty sure if I sent my laptop back as is, after a repaste, no Asus engineer is going to be able to notice. Don't quote me on this, I'd be interested in hearing others advice. Give them the option of RMA, or giving you permission to repaste without voiding warranty (get proof of this in writing/email). I purchased mine from Amazon, and have a month return period, and I sure as hell know Amazon wouldn't be able to determine a repaste or not. Well my bios was automaticaly updated from 302 to 303(windows update), so maybe this is a factor, but cant be sure, because i didnt test the laptop before the update. In other games lets say Metro Exodus and assassin's creed odyssey, the temps go up to 97°c+ but there is not so much trotteling. GPU temp dosent go above 85/86°c. Kryonaut you say...hmm, is it hard to repaste by my self? Few times i did open laptops and clean them plus change the fans, but never did a repaste. The only thing that could be tricky is cleaning the old paste of the chips i gues. Any thoughts? That amount of throttling just shouldn't be happening, along with 97+ temps. It was my first repaste of a laptop too! If you've had laptops open before then it shouldn't be anything too difficult. There's some videos on YouTube for Scar II 15" repaste, and maybe 17" too. Basically it's 11 screws and backplate comes off easily. Disconnect battery, disconnect two fan header cables, then unscrew 12 screws to get the heatsink up. I cleaned off the old paste with a dry lint free cloth, and some cotton buds (q-tips), and to finish up, used a little isopropyl alcohol to get surfaces clean. The VRM's and other chips have a thermal paste applied, I didn't touch this as most of it was left in place after I separated the heatsink. But I did apply a little extra thermal paste to chips that Asus had done a poor application with. Then it was fairly straightforward application of thermal paste on CPU and GPU. Goes back together really easily. Thought I'd put together some guidance on anyone wanting to Liquid Metal their GL704GW. Did this last night, and was my first experience with liquid metal. I used Thermal Grizzly Conductonaut. 1. Both the CPU and GPU come with an orange plastic protector. The GPU protector on mine had poor adhesion around the die, and had let factory thermal paste under the edges. I tried to clean this up, but it was under the protector. Trying to seal this with Scotch Super 33 would not have worked. So I took this off to expose the tiny components around the GPU die. 2. 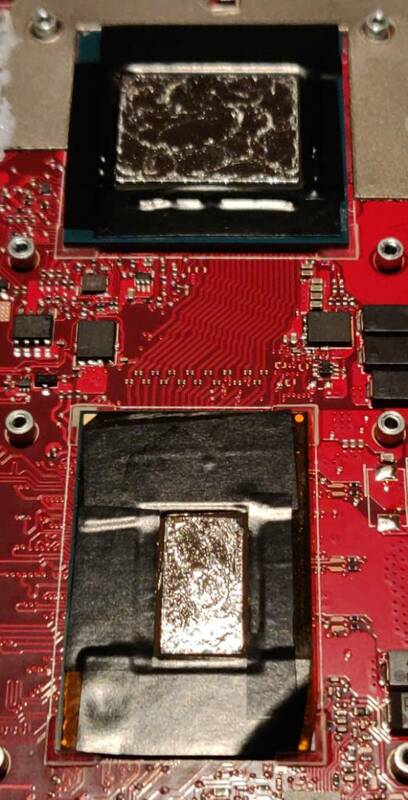 The stock thermal paste was all bound into the GPU components around the perimeter of the die. This wasn't possible to clean with IPA and cotton buds, partially because it had dried on. Maybe easier if a laptop hasn't had any thermal cycling, but I'd used mine for around 20 hours prior to doing this, and the paste had hardened. I actually used the conductonout packaging to get between the resistors etc (the top piece that rips off to open the package). This was flexible and prevented exerting any large force on any components as I scraped away at the paste. 3. After cleaning this up, I masked the GPU with Scotch Super 33. This was very fiddly, as the components you're having to protect are no more than a couple of mm from the die perimeter. Take time with this, get as close to the die as possible without having any tape proud of the GPU heatsink surface. Use something sharp and plastic to press around the tape and ensure good adhesion around the edge of the die. 4. The CPU orange protector was extremely well adhered to the CPU socket. I tried to remove this, but it required a huge amount of force and I decided against this (see picture where I've lifted up the corner of the protector). If you want to remove this, I'd probably suggest using a heat gun to warm the adhesive layer. At standard room temperature, you'll have a bad time. That said, there's a good gap around the CPU die and protector, and no components are particularly near to the die perimeter. I decided I could mask around this edge with scotch tape for some added protection, but I honestly think you could miss out on this step. NB - the CPU die only sits slightly proud of the tape when double thickness (where it overlaps on corners). Do not allow any more than two layers of scotch super 33 with this, otherwise you'll likely prevent good contact with heatsink and CPU die. 5. Apply the LM as recommended from multiple/common sources. Note: I did not have thermal pads to replace the horrid stock paste on GPU memory and power regulator chips. I will be doing this asap. From stock to Kryonaut - typically saw a 5-7c reduction in temps. From Kryonaut to Conductonaut - typically saw a further 10c reduction in temps. From stock to Conductonaut - 15-17c reduction in temps. In hindsight, I wish I was more scientific with thermal data gathering for the benefit of others. At stock, 95c on the CPU was seen in games like Apex/BF5, with regular thermal throttling. With LM, I'm seeing 70-75c, with occasional spikes up to 80c. Also worth noting the fan profile used for testing was balanced/turbo. Definitely had some fan speed reduction in balanced mode, along with the 15c or so reduction in temps over stock. The main reason for wanting to do the LM repaste was to reduce fan noise, but the lack of configurable fan curve in Armoury Crate doesn't seem to allow this? Typically see 70-75c on CPU during gaming now, I'd much prefer 80-85c with a reduction in fan speed. Balanced mode is much quieter whilst gaming now, but I'd really like to see how quiet it could go if I allowed the CPU to run a little hotter. Hope this can help advise others who are thinking of LM'ing this laptop. Any comments on how I've done this would be great. Admittedly an LM/laptop noob. Compared to my old gl703vm (7700hq+1060 full) this is much cooler, 703vm with cpu locked to 2.8ghz stays at about 78-84 depends by game, and 74-76 the gpus. i'm the only one with great temperatures? I'm not saying mine was bad. It games just fine as stock, but that's not to say a repaste didn't benefit performance slightly. Was it worth the effort, risk, and jeopardising warranty? That depends on the person. For me, it's a necessity. It's more a compulsive disorder to have everything work optimally. I couldn't look at my laptop the same if I had capped it to 3GHz. Even if moving to 3.9GHz results in a fractional performance improvement at the cost of much greater thermals. Personally I'd rather liquid metal and have better thermals and performance than at stock. I also find anything below 100fps in FPS games really affects my enjoyment of it, and I definitely notice the input lag increase around that point. Each to their own, but if you're content with 60fps at 1080p, a 1060 GTX would have probably been more appropriate over the 2070 RTX. Spudstone can you please be a real, real hero and circle where the 12 screws are to remove when repasting? As well as the two fan connections you spoke about? I am completely new to this and can't find a proper video on youtube to show where the screws are for this particular model. And you said you didn't touch the pasting on the other, smaller, cores, right? Did you remove the pasting from the heatsink? Got my laptop back today...and yeah dont know what to say. From 9.3.2019 to 22.3.2019 and the result is bad! As you can see in pics, after 8-9 min stress test the cpu is hitting 99°c and the thermal trotling is huge, tbh it was better before and also the difference betwen cores, is that normal? If someone can please tell me if doing a repaste by my self or if someone dose it, that knows what they are going, i just dont see the point sending it back the second time for another 2 weeks with no improvment. Well i agree with you for the most... but not on the cap on gaming, for me this laptop is a huge cost and will be with me for at least 3 to 5 years; i don't know how much impact will have cap the cpu on 100+ fps gaming, respect to 60', but if with a simple cap i can gain 10 to 20 degrees at 0 cost for me is the thing to do, at least in terms of long term longevity and cycle life of the product. I only plan to repaste it when the warranty end in 2 years; i think that with liquid metal you have to re-liquid again in 8-14 months (depends on the use) because LM have a loss of performance in time (and corrosion on die and heatpipes, that i don't really love, planning to use for many years). So, in games, i tend to prefer the minimum cap for obtain a good framerate and good temps; different story when i do a video export that i had to use 100% full power of the cpu's that gain me much much shorter times to export, and in this workload the extra freq is really worth using (any way gpu is not used as in games so temps are a little bit lower actually). For gpu's thing, as i said to you on last post, i already had a 703vm with 1060 full, and no, this gpu NOW have no future (it was a beast of a gpu's in 1080p e 1440p for 3-4 years already); in fact i decide to sell the 703vm because of the 1060 on the lower side of 45-55 fps on high settings 1080p on latest games, that will be probably 35-45 on the end of the year; 2070 instead have the right amount of power to do 1080p high-ultra 60fps for at least the future 3-4 years, that is basically the time that i will use this pc. So for me this is a must thing to do having a good $$$ back from 703vm. If you plan to use it for 1-2 year you can stress and kill it as much as you want, but if you plan to use for a couple of years longer i suggest to do those simple tricks that in reality conducts to 0 problems of performance. But ehy, as you said, there are different need for different people, i understand you hungry of performance when you buy a beast like that.